I'm 45 and I got my first bald patch aged 14. One day I woke up with a large bald patch on the top of my head. I was very shocked. I remember looking for the lost hair on my pillow but there wasn't any and I couldn't understand how/when it even happened. Doctors and hairdressers told me it was down to stress and/or my immune system attacking itself. It grew back. But I've had this problem with alopecia areata ever since. Patches appear randomly, some large, some small. I might suddenly notice a completely smooth patch. Or I may not notice it until hairs have already started to regrow. It's annoying but as the hair has always grown back (so far) I've just learned to live with it. I've never sought any treatment. I'm lucky in that I have a lot of thick hair so I've always been able to cover it up. I wish it didn't happen but to be honest I've had it for so long it's just become a normal part of life for me now so I barely react when I discover a fresh one. I have a new one now, and a second one where the hair is already at a couple of inches' regrowth. I got a bald spot on the back of my head which kept growing and growing, after a bad accident where I was badly injured and had a lot of subsequent stress, at age 48. I never had this before to my knowledge. I didn't get the steroid shots for my alopecia areata (AA), since I didn't want the skin damage, and I don't think it grows back hair much more than it would grow back, and anyway, definitely doesn't last, and just seems to be a cash cow for the dermatologists. It is filling in everywhere except a little spot. I have been taking CBD oil from cannabis and also massaging it into my scalp. But, who can say if something in particular worked, since with AA your hair grows back anyhow only to fall out again somewhere else! My young grandson has alopecia areata. He'll be 3 in May. His hair is gone and he is now losing eyebrows and eyelashes. There are no known family members with the condition. We're all looking for answers and for support groups. I had my pulmonary embolism 3 days after giving birth to my daughter. I felt so short of breath and was nearly fainting. They ran some test and found out I had pulmonary embolism. I am still taking Coumadin now, I still feel short of breath and have mild chest pains which eventually go away. My INR is so far in the range for 3 consecutive checks. I still fell exhausted easily. Years ago while under a lot of stress I lost my hair in one spot, and that spot remains sore off and on. I started with shingles, if they were shingles, on my leg that lasted about 3 months to clear. Then after that I got all red and inflamed and very sore to the touch, and the doctors were treating me for cellulitis. I took antibiotics for one week that didn't work. I still have the same problem but not as bad, but it is still bad. I went to a pain doctor and they tell me I have cellulitis inflammation or whatever; it all seems the same to me. I am a 35 year old female and was told I had alopecia areata when I was 30. I just thought it was the end of the world. Being female and bald! Oh no, what was I going to do. So I turned to hair extensions and tried to de-stress my life as best as I could and it seemed to work until July 2014, when it hit me like a ton of bricks. I have lost almost all of my hair and have now turned to wigs. I made an appointment with the local dermatologist to see if there is anything that I can do. It has been a long struggle and I hope there is a light at the end of the tunnel. I am 45 years old and I started losing hair but didn't pay any attention, then started getting spots, I didn't know why. After a while the spots got bigger and I went to the doctor and was told I had alopecia areata. I have hair on the front top of my hair but spots everywhere else. I still cry when I look in the mirror. I wear scarfs, never wore a wig; I tried it but they don't feel right. So now I avoid mirrors. I am a recently turned 32 year old female. I was diagnosed with alopecia areata last spring. I first noticed subtle hair loss. It started more towards my bangs and then spread. I could cover it up at first, but I then started getting more bald spots as time went on. This all started happening as I was ending a very serious and stressful relationship. I spent the entire summer and fall of 2013 wearing a thick headband (such as you would workout in), so it covered quite a large area. I saw my dermatologist (as I have other skin issues such as eczema), in July 2013. I started getting steroid shots in my scalp. This seemed to help tremendously. My hair is now growing back rapidly, although it is more coarse and curlier also. I have tried a ton of different shampoos, as I still feel like I lose a lot of hair even though it is growing back. I was just diagnosed with alopecia about a month ago. It started out as a small bald spot where my bangs were, this was in September. By the end of October it had spread to my hairline right at the top of my head! I can cover it up by parting my hair a certain way, but it just keeps spreading. It's now December and it's about the size of a lemon. They can't treat it right now because I'm 6 months pregnant. I am a 28 year old Asian American female. I noticed a small bald spot when I was brushing my hair. I thought the bald spot was caused due to me parting my hair in the same spot. Since I thought this was the cause of the bald spot I decided to change my part and parted my hair down the middle of my head. That's when a noticed a much larger bald spot. I freaked out but I brushed it off (no pun intended). I thought the bald spot was because my bobby pins that I put in my hair. I am not "stressed" at all really at work nor at home. I saw my PCP and he told me to visit the dermatologist where he confirmed it was alopecia areata. He gave me a topical ointment where it looks like it's a huge Visine bottle. I apply it 3-4 a week. I am not sure if it's totally working but also I haven't noticed any other bald spots. I would have never thought that anything like this could happen to me. If I end up totally bald, I am okay with that. It's just hair--other people in the world have it 10 times harder than me. I'm a 17 year old boy, and I've been dealing with Alopecia for about a year and half. At first I didn't notice it, until one day one of my friends told me that I had a bald spot. It was small so I didn't pay attention to. As time went on and I started to do more sports activities and getting lots of homework, I noticed that I was getting more bald spots, but they were small, so I continued to not pay attention. As time went on I noticed that I had three huge bald spot, but the bald spots were weird, since they were like bumps and full of pus, so the smell was nasty. After I noticed the three huge spots, I quickly went looking for a dermatologist, and in searching, I found a great doctor, and so far my hair is growing back, and I always keep in mind to wash and take care of my head. Basically my Alopecia infection came from the excessive workouts and somewhat stress, but now I limit myself on both of these subject. The same type of hair fall was occur during the year 1992 and after 20 years time again it happened to me during 1992. I used ginger, I applies its juice every now and then when I get time, later it is successful but the same treatment I'm doing now and found no reaction till 2 weeks time. I'm very sure that it will effect as I did this treatment before and it was successful. My Alopecia Areata began after my first marriage dissolved. Tried Nioxin, vitamins, creams, shots, and finally ultraviolet light. My hair grew back with a vengeance (while it was a different texture and much coarser at least there was some hair regrowth). I got remarried within three years. Moved four times and immediately the alopecia started again. This time worse. Bigger and wider bald spots. Did the wig thing and the alopecia resolved again (hair regrowth curly and walnut colored -- I am a dark blonde). I have been very lucky the last ten years. There has been little or no hair loss. Recently I moved and lost my mother. My hair is now falling out again. This time directly in the front and on the crown. Hard to cover. Stress is and always has been my trigger. I have been tested for everything under the sun. Pure and simple for me major stressors equal alopecia. I have chronic insomnia. One of my doctors put me on the blood pressure medicine Diovan. I was on it for 2 years. Last year going to the hair salon, she told me my hair had thinned out, and she could not curly it. I had been wearing weave extension for some time, but I would take them out and wear my own hair previously. I went back to the weaves. This one girl put some clue on the top of my tracks for the enclosure, and then my scalp starting to burn, and became irritated. 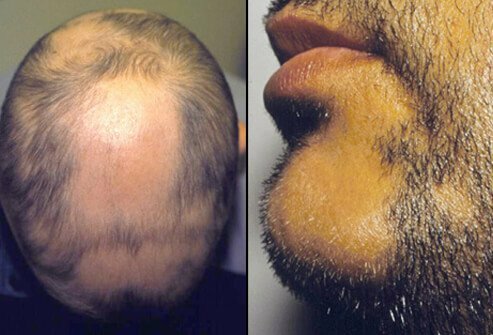 The Diovan can cause Alopecia. I don't know what caused my hair to thin and there are dry bumps on my scalp, but they don't itch. I am very upset and concern, and feel like suing somewhat. I have some stress in my life as well. The stress doesn't stop, but I am trying to relax some. Now my hair is stressing me out. I said I would do better, if I just wash my scalp and keep it clean, but I am tired of wearing wigs. It would rather do the weaves. I don't know what to do. I am seeing a Dermatologist and she gave a shampoo and Steroid solution, but it seems to be getting worst. My hair seems healthier just wearing the weave, because my hair was strong, and not shedding at first. The more I washed it, the drier it looks. I don't see hair on my pillow, so where is it going. My scalp is somewhat red and bumpy mostly on the top. My sides are barely gone, but seem to be growing in some. I pray all the time too. I pray that my hair will grow back. There's got to be a treatment for this. I don't want to go bald. My niece has the same symptoms. She lost her hair and then it grows only to fall out again. On my last trip to VN I found out that one of my cousins had the same thing. She went to the doctor and was given a medicine/vitamin called L Cystene. She took it for a year and her hair grew back. I bought some for my niece, she has been taking it for 4 months now and she got most of her hair back, though the spots that still bald are showing signs of regrowth. The hair that grew back has not fallen out yet. It might be worth a try. I had matching round patches of hair loss on the right and left sides of my head about eight months ago. They started small and grew larger as I lost more hair. The patch on the right side is larger than the one on the left now. Sometimes the areas itch; sometimes they are slightly painful. I have been diagnosed with alopecia areata and told there is no treatment to cure this condition. So, I simply shampoo often with Stieprox to keep the scalp clean, and continue to hope for the best as my hair has always been my crowning glory. I don't want to be bald at 45. I am 44 years old and woke up one day with a bald spot on the top of my scalp. It was horrifying, scary and have only told a handful of people because I am embarrassed by it. I wear headbands every day to cover it. I have seen my dermatologist and have received injections in my scalp and I am scheduled to go for round 2...I am using Nioxin and Rogaine but have seen little improvement. It is hard to look in the mirror everyday. I am a female 33 years of age and just noticed a spot of hairless area on my back just above my neck. It is very smooth and at first I was shocked. Then I consulted a dermatologist and came to know about alopecia areata. My biggest concern is that I think I have the ophiasis pattern which is most difficult to treat. I started experiencing a little general hair loss about 10 years ago. Every day I had extreme itchiness of the scalp and I scratched my head a lot. Everyday I saw more and more hair go down the drain when I washed it. Now after 10 years of this I just found my first bald patch (about 8 months ago) that was about 1 inch circle. Now it's about 3" x 2" and there's another bald patch on the back growing even larger and faster. I went to a hair clinic and they said it was alopecia areata but had no suggestions for treatment other than wigs. I am emotionally exhausted with this problem and it certainly doesn't help the stress which may or may not be the root problem (excuse the pun). All I know is that my scalp is ALWAYS itchy. Sometimes, but not always, even more itchy after I exercise. Does anyone else with alopecia areata experience this insane itchiness? I just don't know what to do! I'm a 49 year old female, living a stressful life and have undergone a Total Abdominal Hysterectomy 14 years ago. I notice a slight change in my hair after about three years after the operation. I did not worry because I thought it's just a temporal thing. I later notice a bald spot at the back and thought I was having a problem with the chemicals at the salon. I cut all my hair to grow new hair. It grew back but I noticed it never went back to what it was before. After some time my scalp started itching and I was losing my front hair. Doctors later associated it with the op and suggested I take calcium supplements. I'm on them now but I just see no change. I experienced the alopecia areata disease at age of 12 when I was still in elementary school. Now I am 28 years old and haven't married yet. It started to form a patch, every single hair that I held was loosened up from my scalp. I lost the entire hair in a month time, including my eyebrow, eyelids, armpit hair, everything. My parents brought me to everywhere, tried so many treatment including Rogain, but in vain. I used to try medicine from China, in a year the hair grew very thick and beautifully. However, I didn't get my period for a year, I gained weight, my voice change to very low, I grew thin mustache. After being diagnosed further, the medicine contains a lot of steroids which is not good for my health. Once I didn't consume the medicine, it came back to the entire baldness. I'm wearing kind of a scarf to cover it. I 'm not using any medication/ treatment now. Just let it be. I started experiencing my alopecia around the age of 25. I started noticing a lot of round patches, some small and some silver dollar size. Over the next five years I started seeing a dermatologist whom prescribed a minoxide creams, steroid injections to my scalp and even prednisone. This helped and seemed to settle the disease for around seven years. I started getting symptoms once again, silver dollar sized patches and loss around my hair line from and back. I got pregnant and my hair started growing, however about a year after I gave birth the disease was back. I got my first patches when I was 24. The doctor I consulted said there is no treatment for alopecia. He said if it were to spread, that they would give an injection to the scalp. I was really disappointed. It is weird, but a barber near my place while cutting my hair noticed the patch and said he knew the treatment. It was a bit painful, and he said he would not perform it on female patients. He rubbed some leaves around 12 times and then pressed a sliced lemon on that place. The patch looked as if it got burned. After seven days, the skin fell off. After 15 days, I saw baby hairs growing with no pigment. Within four days, my hair turned black and started growing normally. The patch came back in a different place after two years. This time, I went to an Ayurvedic (traditional Indian medicine) practitioner. He prescribed one herbal powder. He asked me to mix it with curd and rub it on the bald patch by applying a little pressure. He asked me to do this daily at bed time for two months. But I did it only for a month, and the hair grew back. I suspect it might be related to stress. One of my distant cousins who was staying with me got a bald patch after some time, too. Weird but true. We used to have junk food and skip meals. This might have spoiled our metabolisms. It was really frustrating to have bald patches. I am 32, with one son 18 months old, about 10 weeks ago my hair just started falling out after years of having extraordinarily long thick hair. I now have 2 large bald spots one on the side one in the back as well as several smaller bald spots. I have had a lot of stress in my life but my life is usually stressful and my hair never fell out before. It's just hard to believe that it's happening. From everything I've read it usually happens at an earlier age. I am 53 years old and have had alopecia since I was 3 or 4my mother said it started out as moving baldness then it cleared up till I was around 12 or 13 and then I lost every bit of my hair including my eyebrows, when I was 17 it just started growing back on its own then when I was 38 I was stressing out a lot and it started all over again but not as bad then when it grew in this time it grew in white. I understand it to be an immune deficiency. I know someone that lost a patch of hair and visited a holistic doctor that stated that there was too much aluminum in the liver. She was detoxed and told to never use aluminum cooking ware, and drink distilled water. I do know that there was a court issue on the onset but after the liver being detoxed and later cleaned the spot left in nearly a week. I am 17 and have been battling alopecia areata since I was 8. I lost 75% of my hair but thankfully it has since grown back. But I still have little spots from time to time and no hair on my arms and legs. I am 16 years old and now alopecia areata is the one and only cause of my worries. As for every teens, hair seemed to be one of the treasures in my life. One day when I woke up. I saw two bald patches which grew bigger and bigger day after day. First I took aloepathy medicines. But it was of no use. Then I consulted an Ayurveda doctor and she prescribed me TRICHUP oil, tablets and shampoo which proved to be effective. My hair started falling out 2 years ago I'n 21 today and am almost bold no treatment has worked for me for alopecia areata. I am a 43 year old African-American woman and I am experiencing signs of alopecia areata. It all started when I was 40 years of age. I was going through financial problems and stressing about other personal issues. I have been diagnose with high-blood pressure and is currently being treated with Hydrochloride, which I don't believe to play any role in my hair loss. I am currently receiving injections of Cortisone in my scalp and taking hair, nail, and skin vitamins. My hair is growing back slowly but surely. It has been 3 months since I've started the treatments and I haven't had a relaxer or color in my hair for whole year. My alopecia friends stay positive and be patient. I was 51 when I had my first experience with alopecia areata. I had two nickel sized spots on the back of my scalp. In addition, I have two other auto-immune problems, scalp psoriasis and hypo-thyrodism. I believe stress was related to my hair loss. Treatmeant was steroidal solution, which helps psoriasis also. In any event, it grew back about 3 months later and I haven't had any issues with hair loss since. I was diagnosed with alopecia areata four years ago. Cycles have been about yearly with patchy hair loss. Currently I am bald again-shave and wear a bandada (2nd time for extensive scalp hair loss). When the worst flares occur, I have weight loss (about 20 pounds), fatigue and joint pains in the small joints in my hands. I have a history of atopic dermatitis and allergies. I understand this autoimmune illness only involves "hair". No one seems to know what the actual cause is for my alopecia areata. I was going through medical school and under a lot of stress and lost one of my eyebrows. After my schooling finised it grew back. It was stressful for sure. I went for years without a reocurrance and underwent another stressful event in my life and it came back but I am now losing patches of hair in my scalp. I have been going to a dermatologist for 2 years now for injections and every time a patch grows back another one appears. I used to wear a ponytail but now I can't as it shows my bald spots. I wish there was a cure. I just turned 30 and I've been sufferring from alopecia areata since I was 12. It's really alot to go through. No permanent solution for it, whenever symptoms occur I have to go to doctor to get some injections in my scalp which is really painful. It has affected me in every way like self confidence, my social behaviour, depression, anxiety, everything...but still I dye my hair and use hot tools because I want to live a normal life. I had MCL surgery and within 90 days had a patch of alopecia areata show up. Since then, it's increased to about the size of a baseball. Prior to the surgery I had a urinary tract infection, the doctor gave me 30 days of cipro, then he gave me another 30 days because the infection was still present. After the 2nd round of antibiotics (within 3 weeks) is when I had my surgery. My daughter suffers from alopecia areata since infant vaccinations. We are told that as the condition is not life threatening, there is no serious money spent on finding a cure. I don't think people realize what sufferers of this condition go through. The odd looks from strangers at the shops, the teasing from kids at school, etc. It is really sad to see such a young child have to deal with the emotional stress bought upon by "who knows what!" My sympathy goes out to all those suffering from this terrible condition. I've probably have 30 small bald spots on my head. They started around 15 years ago. It's gotten so bad I just finally shaved my head. People would stare and I'm a Marine and I found being stared at confrontational because of the ignorance of people, so when I shaved my head the stares stopped. My head looked like I had the mange. I've not lost any other hair on my body. You would think modern medicine being as advanced as it is they could find a cure. Mainly around the perimeter of my scalp but I have found that my hair has thinned to that of a baby's on my scalp all over with little smooth spots all over my scalp. Everyday washing I find a clump of hair falling out, literally! Patches of loss hair, itching, and redness, pain in the scalp. I will be 32 next month and was diagnosed with alopecia 4 to 5 years ago. I'm sure it was all due to stress. (bills, relationships, money, etc) I do not have a bad case of it so I am beyond blessed. I started off with a small patch in the back, then patches in my eyebrows and got needle injections faithfully once a month, and the hair grew back every time. I would have to spray black hair spray on my spot in the back, being as though I wear a short hair cut, and also would have to use an eyeliner to color in some of my eyebrows. My eyebrows have been okay for a couple of years, but I do have a small spot in the back of my head again that I don't spray anymore, but just leave extra, longer hair in that area. I've learned to embrace my disease and again am thankful because it could be ten times worse!